Their goal, as provided by the site’s tag line, is spreading “humanist counter-theory” in the “age of misandry.” Clearly no matter what the folks at AVfM think of feminists (whom they compare to the Ku Klux Klan and other purveyors of hate), they believe they are struggling for the human rights of men. So imagine my surprise when Paul Elam wrote a post lauding prolific video blogger Paul Ray Ramsey. Ramsey, better known by his pseudonym RamZPaul, is a relatively well-known white supremacist who, just last year, was profiled by the Southern Poverty Law Center. 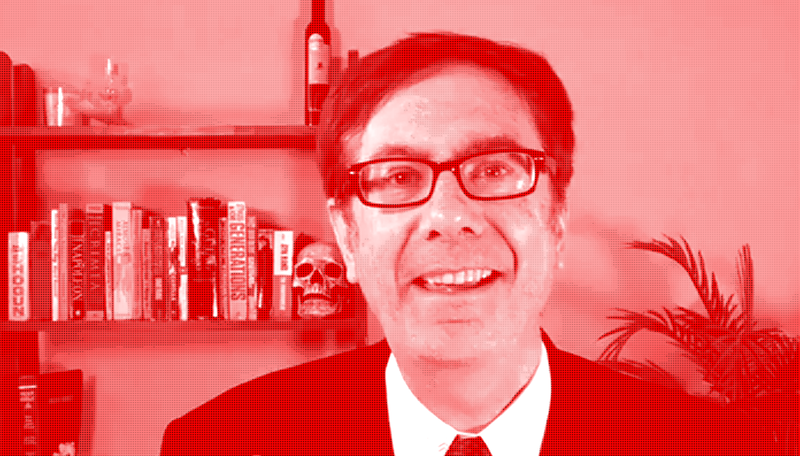 Known by fans as the “Smiling Nationalist” for his use of humor and satire to discuss topics like race, feminism, immigration and LGBT rights, Ramsey’s videos are often shared approvingly on hate sites such as Stormfront and Occidental Dissent. Of course, you wouldn’t know this from Elam’s article about Ramsey “pwning” comedian Chris Gethard. Although he describes Ramsey as “just a feminist critic,” Elam actually prefaces his post with a small disclaimer of sorts. This is probably true. Ramsey does not appear to fit the profile of a Men’s Rights Activist, MGTOW or any other person affiliated with the so-called “manosphere.” However, this does not necessarily matter, since Elam admits to having “enjoyed many of [Ramsey’s] videos,” supposedly all without knowing that Ramsey is such a high-profile racist. And in one of his latest videos, Ramsey excused violence among black Americans because they “don’t have the IQ, they don’t have the self-control” necessary to avoid attacking others. He elaborated his position by way of a parable which likened black Americans to rattlesnakes infesting a home. Instead of venting one’s anger at the rattlesnakes (even if you killed one, more would take its place he reasoned) Ramsey explained that we should instead be angry with the people who are throwing the rattlesnakes into the home in the first place. “Really, the guilt is the guys throwing the rattlesnakes into your home. And the solution is not to get upset at rattlesnakes, ’cause that’s just how they are, that’s their nature. The solution is to keep the rattlesnakes out of your home.” “Oh boy, if people could figure out this video I’d be in trouble,” Ramsey said slyly, practically daring viewers to understand his metaphor. It is also true, as Paul Elam wrote, that Ramsey is a harsh critic of feminism. In a video response to the recent Hobby Lobby decision, entitled “Home Depot Declares War on Women,” Ramsey uses the home improvement retailer as a stand-in for the Christian craft store chain to make a point about providing female workers with contraception. Feigning concern for working women, Ramsey said that a female cashier might not be able to afford a box of condoms (“‘Cause they cost, what, like $20?”) because she might have “blown that [money] on bling.” Moreover, companies like Hobby Lobby (or Home Depot) should be taken to task for an even more heinous crime: refusing to provide free food to employees or anyone else who needs it. Barring the fact that this is in no way analogous to the Affordable Care Act’s contraceptive mandate — not to mention the fact that this in no way resembles how insurance works — Ramsey’s skit is, of course, grotesquely racist and misogynist. So why does Paul Elam find Ramsey’s videos to be such a source of entertainment? Either Elam is a fool who cannot interpret satire or even comprehend Ramsey’s calls for a whites-only ethnostate, or Elam shares or deliberately ignores Ramsey’s uglier views. Elam’s disclaimer could rightly make people believe that the latter is actually more likely, since he told his readers that Ramsey had neither posted on A Voice for Men nor been active in the broader men’s rights movement. If Elam truly does know about Ramsey’s repugnant racial views, why would he support Ramsey’s videos on such a high-profile platform? After all, A Voice for Men is “the most widely read men’s rights website in the world” in Elam’s own words. Does Elam share in Ramsey’s crude racism in addition to his blatant misogyny? If Elam is standing up for all men he should have to answer for that, especially since he’s fresh off the heels of his international men’s rights conference in Detroit — a city blighted by economic turmoil and racism.